Gold Makes New All Time High! Where Next? Here’s the game for anyone who doesn’t have the time or inclination to follow the markets, and you won’t hear this on TV either. The US Federal Reserve is acting as the buyer of last resort in the bond market in an effort to give the appearance that demand for US debt exists. They print dollars to do this. In supporting the bond, and stocks to a lesser degree, they will destroy the US dollar. Yesterday the greenback took a big hit and today it is getting walloped again. Sooner or later this will spill over into bonds and stocks, and I am convinced it will be sooner. In fact I believe it will happen now! Everyone talks about buying blue chip stocks with good dividends, or bonds as a “safe haven” investment, but the smart money won’t touch either. The smart money is buying the true save havens of gold, silver and the Swiss Franc in that order. That’s why the Swiss Franc has broken through par today, in spite of the best efforts of the Swiss central bank, and that’s why gold made a new all-time high today. These events are no accidents! Although not shown on the chart, the RSI was at 59.48 as of yesterday’s close so gold will not technically be overbought even with today’s jump in price. Point & Figure chart now has a bullish price target of 29.00 and I think that may be closer to the truth. Notice that I have neglected the subject of gold and silver stocks and that’s because they are paper. I sold out the last of my portfolio two weeks ago and don’t own a single gold stock for the first time since 2002. With that said if I wanted to own stocks I would be extremely selective and would only buy stocks listed on the Canadian (Toronto) Exchange, with one exception and that is Buenaventura which is listed on the Lima (Peru) Stock Exchange. I would buy them in their local currency thereby avoiding exposure to the US dollar. There are only four companies I would consider, Royal Gold, Goldcorp, Buenaventura, and Silver Wheaton, and three of those pay dividends. Today the HUI made a new intraday high for the entire move higher and looks good, but its only paper. My fear is that it will be affected with guilt by association, meaning that when stocks, bonds and the dollar fall, all paper will go down with it. What’s more I worry about confiscation of gold and gold producing companies in the US, and the IRS recently raising taxes on gold investments is just the first step. They could raise capital gains taxes on profits from gold stocks and then seize your stock. Everything is possible with a desperate government. I want to clarify something here. If I had to choose I would always buy gold over silver. 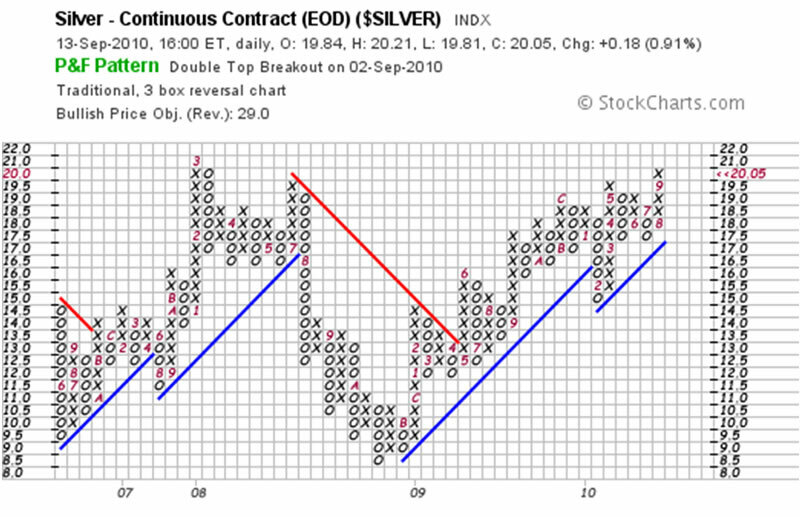 With that said I believe silver has more upside potential over the long run than gold. Silver can go to US $180.00 while gold could go to US $5,000. Percentage wise silver should post greater gains.